For more details on this Teen Camp go here. Full or partial scholarships are available based on financial need. If you and your child feels called to attend a Wild Roots Summer Camp but would be challenged with camp cost, please email us here to discuss how we can support your child to attend. Our mission is to ensure that every child has the opportunity to participate in our programs. A few times per year, we offer Nature Art Camps for Children and Teens. In these multi-day camps we will enjoy nature walks, take in sustainability lessons, play games and craft artworks from natural and recycled materials. We love to connect our artworks to the current seasons, moon cycles or natural rhythms of the environment we live in. In this we can often find gratitude, new awareness and peace in syncing into our own natural rhythm. In the warmer months, this may look like creating Plein Air paintings on the river's edge or making plaster casts of animal tracks in the mud puddles along the trails. And in the colder months...we might do shorter nature walks in the snow to collect pine cones for crafting or we may find cozy places to create art projects that explore our inner landscapes (for example: self-portraits or community art projects). 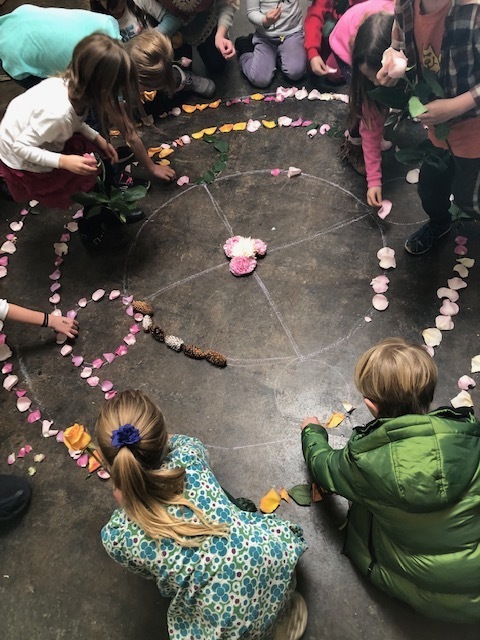 Nature Mandalas & Earth Looms – Lessons & Activities centering on Seasons or Native Plants. Journey Sticks – Stories of how Indigenous people used Journey Sticks. Bee Wax Candles - Lessons on the importance of protecting the bees. This year's camps will be held at The Art Lab located in Old Town Fort Collins and The Wild Roots Art Barn located at 444 N. Sunset Street. Art Lab Fort Collins is located at 239 Linden St, Fort Collins, CO 80524 in Old Town Fort Collins. Learn more about The Art Lab here. The Art Lab will provide our camp's home-base, from there we will journey off on shorts nature walks to Heritage Center Park & Buckman Park to explore and collect nature for our crafts. Wild Roots Art Barn - Coming Soon! We are excited to start offering classes in our Wild Roots Art Barn in Fall 2019. The Are Barn is located in NW Fort Collins. This space is ideal for our smaller classes. It allows for us to create nature under the beautiful Colorado sun and is surrounded by vegetable and herb gardens from which we can gather ingredients for some of our art projects and wild snacks. Our younger child camps are aimed for ages 5-10 and our older kids camps are aimed for ages 9-13. We will be offering our first tween and teen camps this August. For more details on our Teen Programs visit here. Summer camps run from 9am to 4pm. Children may be dropped off anytime between 8:30am - 9am. Spaces are limited. Wild Roots accepts cash, check and credit card. Email us here to arrange paying with cash or check. If you fill pay online, you will receive a confirmation email. Wild Roots will send email with camp details the week before class with camp details. In the event that a class is full, email here to be added to our waiting list and you will be notified promptly if space becomes available. CANCELLATION POLICY: Fees will be refunded if cancellation is made THREE (3) weeks prior to the program. In all cases a 10% administrative fee will be retained. SCHOLARSHIPS & DISCOUNTS: Full or partial discounts are available based on financial need. If you and your child feels called to attend a Wild Roots Summer Camp but would be challenged with camp cost, please email us here to discuss how we can support your child to attend. Our mission is to ensure that every child has the opportunity to participate in our programs. We appreciate all donations to support children who may not otherwise be able to attend. Each 5-day camp will end with an opportunity for children to show case their masterpieces in a Children’s Nature Art Show open to the community at the Fort Collins Art Lab.